Strawberry is the flavour of summer, in much the same way that cinnamon is the flavour of winter. 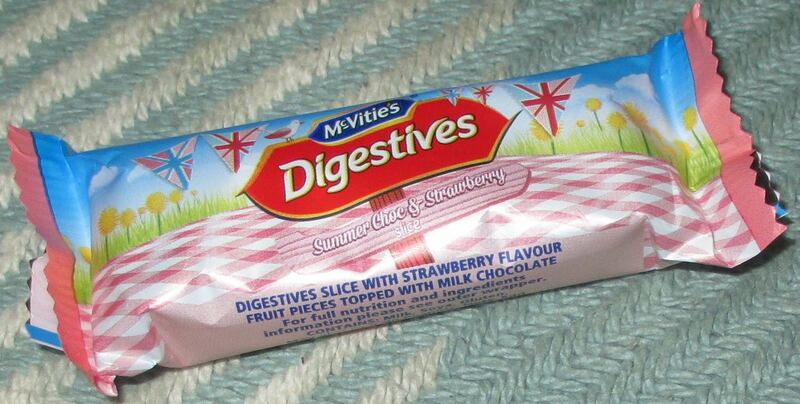 McVities have released some new Summer Choc and Strawberry Digestive Slices to mark the season. When I opened the box I was pleased to see that these were individually wrapped, as otherwise I'd feel obliged to eat all 6 at once! :-D The wrapping makes them perfect as a lunch box treat, but also sensible for things like taking them on picnic. Unwrapped I could see that the slices had a thick layer of chocolate and quite a few strawberry bits mixed in too. The strawberry bits showed through a red bits mixed into the base. The Digestive base is quite soft, not heavy like a flapjack, it was far lighter than that. The flavour was good, I could pick up on all the wholesome flavours of the Digestive biscuit but there was plenty of sweet strawberry bits too, them were juicy and added sweetness to the taste. The chocolate on top was quite thick, but the flavour from it was milder than expected, still it was sweet and creamy and added a pleasing shot of cocoa. I can see these being a popular summer treat, perfect to have in for an impromptu picnic, but I'm looking forward to eating them up as an occasional afternoon treat at work.